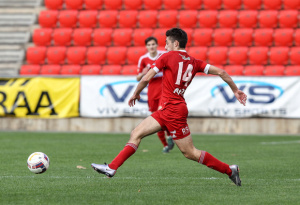 Ten-man Campbelltown City overcame a slow start to defeat Adelaide United 2-0 in Round 21 of the PlayStation 4 National Premier League South Australia at Steve Woodcock Sports Centre on Saturday. Anthony Ture and Jake Monaco netted in a five minute spell shortly after half-time, with Campbelltown keeping the Reds at bay despite Adam Piscioneri’s 65th minute red card. Red Devils defender Shaun Harvey said it was an important victory, even if Adelaide City’s win over South Adelaide confirmed Campbelltown will finish second. “It was a good victory to keep our momentum going,” he said. “We wanted to make sure we kept that up and now we have Adelaide Blue Eagles next week, which is another tough game. Our focus is one game at a time, we will worry about the finals when we get to it. “(Coach) Joe Mullen said at the break to switch on a bit more and we knew it wouldn’t be easy. Adelaide United coach Mark Jones felt a lack of quality in the final third hurt his team, leaving the Reds needing a draw next week to ensure survival. “We are a little disappointed,” he said. “We had chances to take the lead in the first half. It was perhaps our best 45 minutes of the year. But our finishing has been the problem most of the season. “At half-time I said to the guys they needed to play for 90 minutes and keep a clean sheet. We conceded two goals in a short period. First came against the run of play, and then a set piece and we are left chasing the game. Neat work from Adelaide United gave Ryan Strain the chance to curl a 12th minute shot, but Campbelltown goalkeeper Nicholas Harpas got behind the ball to save. The visitors had the best chance in what was an impressive first half performance. Blake Carpenter got the better of two Campbelltown defenders a minute before the interval and squared for Joshua Mori, who was denied by a fantastic Harpas stop. Piscioneri’s deflected 54th minute free kick had to be tipped away by Reds shot-stopper Daniel Margush. Yet there was little the goalkeeper could do a minute later as Piscioneri centred the ball for Ture to sweep a left-foot finish into the bottom corner. Campbelltown doubled its lead in the 59th minute. Captain Iain Fyfe’s free kick hit the wall and Monaco was the first to react to finish from close range. Adelaide United nearly found an instant reply, but Johnny Koutroumbis was denied by another piece of sharp goalkeeping from Harpas, after the shot was deflected on its way to goal. Piscioneri was sent off with 25 minutes to play following a second bookable offence. The home side kept Adelaide United at bay for the remainder of the contest despite the numerical disadvantage. Substitute Jacob Williams was on the end of a swift Campbelltown counter-attack with only minutes remaining, but dragged his shot wide of the far post.